We are excited to announce the MineCon website has received a major overhaul with tons of new information. Check out the updated schedule, a little FAQ and more updates. Our AMAZING room rate at Mandalay Bay is only good for another few weeks. Book now before you lose out on the great pricing. Click here to book. Now on to more MineCon swag… For the first time ever, Mojang will be giving Minecraft Cloaks to all MineCon attendees! You’ll receive your cloak before MineCon and be able to keep it even after the event is over. 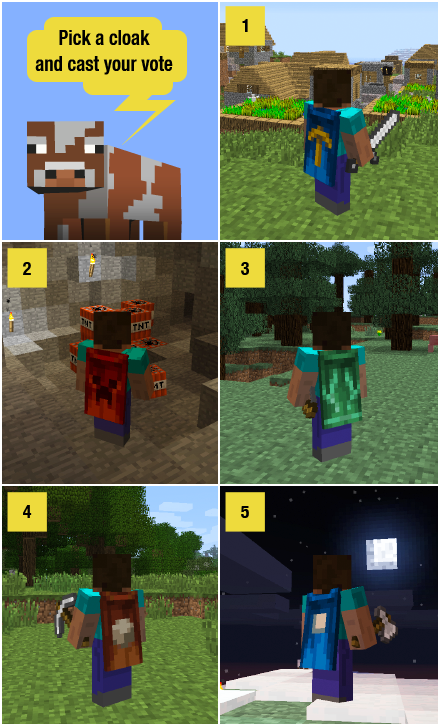 We have made a few suggestions for cloak designs and we need your help deciding on the official cloak. Voting ends Monday, September 26th. Cast your vote here.